“The disciplinary board decided that there is not sufficient evidence to implicate the involvement of Mr. Yekeh Jerry regarding the allegations of corruptions made against him,” said Caf secretary-general Amr Fahmy in a letter to Yekeh. The Liberia Football Association (LFA) has welcomed Caf’s decision. “We are so grateful to God that he was able to clear every one of us not just Jerry Yekeh,” said Ebenezer Stanley Konah, LFA director of referees. Caf has already banned a number of match officials after the release of the Anas’s film including a life ban for Kenyan referee, Aden Marwa. 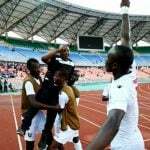 A total of eight Ghanaian referees were also sanctioned by Caf – two for life and six more received 10-year bans. The Referees Association of Ghana recognised the eight bans by Caf and also recently sanctioned a further 53 match officials – six for life and the remaining 47 for 10 years.